« CSA challenge: braising greens out the hoo-ha. This week in Dairy: Yogurt! A few years ago, while sitting in a restaurant in a small town in India, I watched a man obsessively pouring steaming milk from one container to another for several minutes. Finally, I asked him what he was doing and he told me he was cooling milk to make yogurt. Naturally, I got excited and told him that I also make yogurt at home in New York City and we had a nice bonding moment. He then asked me where I kept my goat. If only I had a goat! Of all the ways to ferment dairy products, yogurt is the most straightforward and probably the oldest, dating back to 2500 BCE. Pliny the Elder talks about it in his Natural History and apparently Genghis Khan was a fan. For most of its history, yogurt was a staple of the Asian and Eastern European diet and virtually unknown in the United States until the early 20th century. According to the font of wisdom that is Wikipedia, yogurt was first introduced to the United States in 1929 by Armenian immigrants who started “Colombo & Sons Creamery” delivering yogurt all around New England by horse-drawn wagon. By the 1950’s it was seen as a health food and today you can judge its popularity by the amount of real estate it takes up in the dairy aisle of the supermarket. Despite all the ingredients you will find on the side of a package of Dannon yogurt, the only elements you really need are milk (cow or goat) and a live active culture that includes Lactobacillus bulgaricus (the probiotic sometimes referred to as acidophilus or bulgaricus) and Streptococcus thermophilus, the agent that causes yogurt to thicken and coagulate. Start with some good milk. Whole milk yogurt is the best, but you can make low-fat, too. The best results seem to be with milk that isn’t ultra-pasteurized. Which means expensive. But then again, when was the last time you bought 8 containers of yogurt for less than $6? 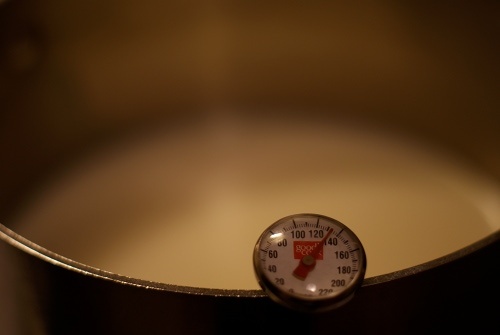 No matter where you get your culture, once your milk has reached the temperature range of 110° – 115° , ladle out about one cup and mix it with the starter culture. 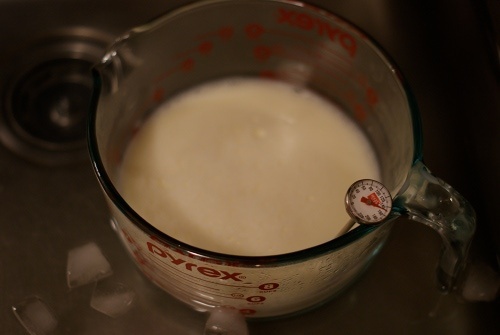 When it is thoroughly mixed in, add it back into the rest of the milk and you are ready to let it do its work. 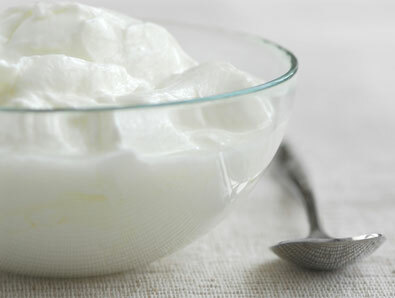 To transform your milk into yogurt, the trick is to keep it at a temperature between 105° – 122° for 6-8 hours. 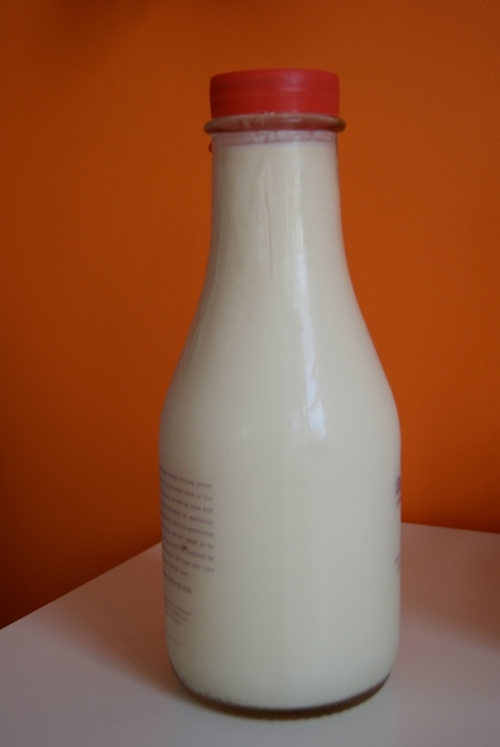 The simplest way to do this is to pour your milk into a warm jar, wrap it in a towel and put in a warm spot. You could heat your oven on the lowest setting for a few minutes, turn it off and put the jar there. I have a friend who puts hers in her microwave (off, of course) overnight. Or you could wrap your jar in heating pad or use a wide mouth thermos. After 6 – 8 hours, transfer it to the refrigerator for another few hours to cool, and then open your jar and voilà!, yogurt will be yours. If you would like to further thicken your batch to make lebneh, let it sit in a cheesecloth for a few hours to drain. It’s as simple as that. Except when it isn’t. We went for years making yogurt with fine results until suddenly our luck changed and batch after batch turned out sour and runny. Or viscous and tasteless. It sucked. We couldn’t figure out what had changed, so I turned to a trusted source, The Complete Guide to Making Cheese, Butter, and Yogurt at Home: everything you need to know explained simply, by Richard Helweg. After perusing the “Troubleshooting Yogurt” section, it turns out we had gotten a bit lazy. Often we overheated the milk, sometimes we added the wrong ratio of culture, and then there were the fluctuation in temperatures while the yogurt incubated. While I still really love the simple jar method, a way to ensure you will maintain an even 110° is by investing in an electric yogurt maker. We use the Donvier Cuisipro which we like very much. 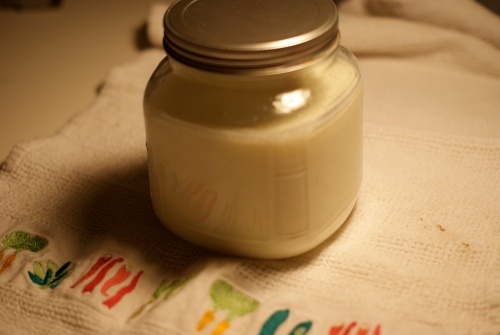 It produces 8 little reusable plastic jars of yogurt that are easy to carry around. Mixed with honey or jam, they make a delicious breakfast. So, the conclusion to this story is that making yogurt is simple, but requires attention. If you have that perfect warm spot in your kitchen, all you need is a jar and a towel. 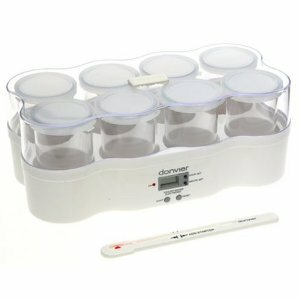 But if you are looking for consistency (or single servings) consider a yogurt machine. Among all of my adventures in the culturing and fermenting of dairy products, making yogurt is the only one that will actually save you money and is fairly easy to work into the kitchen routine. Are you making yogurt? Do you have any tips? Recipes? Crazy stories about goats? Try it out and let me know what happens! Coming soon in Dairy: Mozzarella, Paneer, and Chèvre. This entry was posted on October 6, 2010, 8:51 am and is filed under Dairy, kitchen. You can follow any responses to this entry through RSS 2.0. You can leave a response, or trackback from your own site. Mmm no tips here but yum, I had to open the fridge and have one, Yomo al Pistacchio, double yum!!! My dad makes yogurt though, a Chinese visitor taught him how! Italian yogurt is no doubt a million times better! I need Stefano’s yogurt making tips… Hope you are well! I make mine in a 3 quart heavy saucepan and after adding the starter, I put the pot on a heating pad set to medium for 7 hours. Then into the fridge overnight. I have been getting consistent yogurt for several years. I always strain it to some extent. And then use the whey in breads and other baking adventures. Yum. You’re right – it is really easy and economical. I too wish I had a goat. I should try the heating pad. The yogurt machine works fine for us for small batches (good for school lunch), but not so great for larger amounts or making yogurt cheese. Thanks for the idea! Growing up in India, I don’t remember a single day without homemade yougurt. It’s called “curds”, back home. I still make yogurt here in the US, with 2% non-homogenized milk. though my version is not nearly as scientific :-). I just gauge the temperature before dipping in my culture and stick the pot in the oven. It tastes like ice-cream! Top with fresh blueberries and almonds or walnuts, for complete indulgence! Oh, also, the runny, sour cheesy yogurt that you mentioned is how paneer is made. And may I ask, what little town did you visit in India? Did you know that buffalo milk is not commonly used for making yogurt because it has less fat. But the milk tastes delicious. Hello! And thanks for the information – I would prefer to make my yogurt in our oven, but I think it’s too cold. Or maybe I don’t have the right touch… The town I was visiting in India was Orchha, and it was magnificent. I really hope to go back one day.